After 18 holes of golf at Oahu’s Mid Pacific Country Club with friends, which took about five hours, President Barack Obama is back at his vacation rental in Kailua, Hawaii. A group of about 25 onlookers gathered on the roadside Monday near the 18th green to watch the president finish up his game. Some in the gallery were dressed in hiking gear as the entrance to the Lanikai Pillbox hike is close to the golf course. The motorcade hit a small traffic jam near a congested intersection where beach goers with kayaks cross the road. 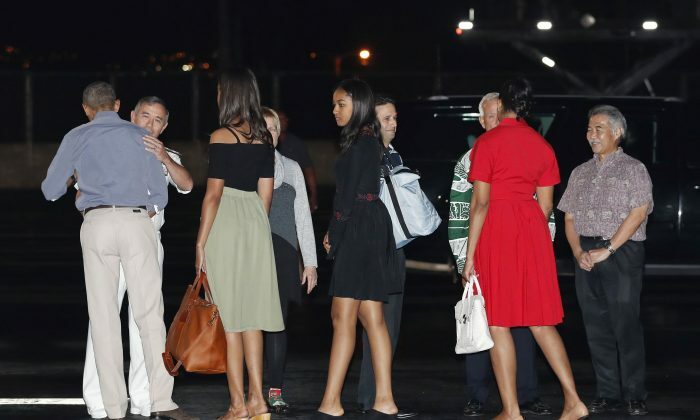 President Obama and his family capped another day of their Hawaii vacation with dinner Monday night at one of Honolulu’s most exclusive restaurants. The first family traveled from their rental home in the oceanside town of Kailua to the Vintage Cave, a French-Japanese and sushi restaurant with an extensive art collection. En route, neighbors waved and took photos as the Obamas’ passed by. The motorcade got stuck several times in rush hour traffic but it pushed through the gridlock, and continued through areas lit up with Christmas holiday lights and displays. The president has stayed in the same coastal neighborhood each winter during his tenure. During his vacation in Hawaii, President Barack Obama has been briefed by his national security team on the assassination of the Russian ambassador to Turkey. The president on Monday directed his team to give him updates as warranted. After a morning workout, Obama headed to Lanikai, where he will play golf at Mid Pacific Country Club. Obama has played golf at the club during his annual vacations to the islands. Last year, he sunk an impressive 40-foot putt on the 18th green that drew cheers from those watching from the road outside the course. The president is teeing off with friends Bobby Titcomb, Greg Orme and Joe Paulsen. After spending more than an hour at the gym on a Marine Corps base, President Barack Obama’s motorcade left to return to his rented vacation home in Hawaii. Some people gathered on the side of the road Monday, waving and snapping pictures of the motorcade as it passed by. A painted sign reading “Aloha Obama Ohana” sat at the entrance of the neighborhood in the town of Kailua, where the president is staying while back home in Hawaii for vacation. President Barack Obama is starting his day at the gym during his year-end vacation in Hawaii. A partly overcast sky made for a hazy sunrise Monday as the president’s motorcade traveled from his rented vacation home to a nearby Marine Corps base for the workout session. The president is staying in the town of Kailua while back home in Hawaii for vacation. He has stayed in the same coastal neighborhood each winter since he was first elected president in 2008.